Just over a week ago, all eyes were on Ireland as the country took to the polls to decide whether to repeal the Eighth Amendment and allow Irish women to access safe, medical abortions. #VoteForYes united people over social media, Irish citizens came home in droves to make their voices heard, and women and their loved ones shared powerful stories about having to flee to England to access life-saving care. 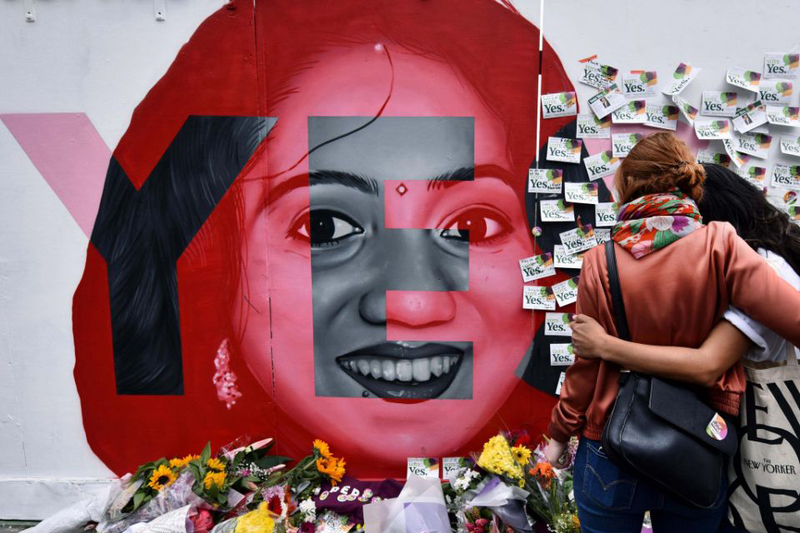 One of the most poignant stories of the Yes movement was that of Savita Happalanava, a 31-year old Galway dentist who died of sepsis in 2012 after being denied an abortion while naturally miscarrying. This isn’t the first time in recent history that Ireland shocked the world with its progressiveness — in 2015, in another referendum, it became the first country in history to legalize gay marriage by popular vote. Recent plebiscites in the UK (to decide on Brexit) and Colombia (to decide on a peace deal with FARC rebels) put the power in the hands of the people, with surprising results. In this edition, we take a look at the pitfalls and positives of holding referendums, and some of the communications tactics employed by both sides to influence the outcome. Derry native and longtime Dubliner Nora Eastwood worked in communications for the Citizens’ Assembly, a public group set up to consider several questions around the abortion debate. She offers an insider’s look at Ireland’s long simmering “quiet revolution” and the tactics from both camps that ultimately led to the success of the push to repeal the Eighth Amendment. In this debrief of Ireland’s “Repeal” campaign, Anne Enright affirms what professional communicators already know: a heartfelt personal story is not a thing to be underestimated. The fear mongering and grisly imagery employed by the “no” side could not compare with the tangible experience of every Irish woman who shared her story of having to travel for a safe abortion. In decisions like these, Enright argues, voters tend to go with their gut over their brain. By kicking people in the gut with their signs, inaccuracies (such as “abortion causes breast cancer”) and hypotheticals, the “no” side irreparably damaged its credibility, and cooler, more reasonable heads prevailed. When Colombia went to the polls in October 2016 to vote on ending its 50-year, bloody civil war with FARC rebels, the expectation was that its citizens would vote a resounding “yes!” As it turns out, the rest of the world (and President Juan Manuel Santos, who won the 2016 Nobel Peace Prize for his efforts) didn’t anticipate the depth of Colombians’ resentment. This debrief offers a fascinating look at the nature of referendum communications — why the side advocating change usually loses, how voters use them as a political protest (a la Brexit), the importance of the distinction between election campaigns and referendum campaigns. In Colombia, the No side’s message of “We are not against peace. We are for a better peace” ultimately won over voters. A month on: What went wrong with the Colombia referendum? Oxford professor Alexander Betts’ TED talk about why Brexit happened, and where we go from here, is a longer watch but well worth it. Betts explains what mattered to the “leavers,” what they got wrong — and right — about who benefits from immigration, and how the “remain” side failed to communicate the real benefits of globalization to Britain’s less metropolitan areas. Those that voted to leave actually benefited most from EU membership. As feelings about refugees were also a major factor in Brexit, Betts advocates that the key to successfully settling refugees lies in ensuring benefits are also given, and accurately communicated, to the host community. The Ezra Klein Show: Not only is Ezra Klein, Vox’s editor-at-large, a purveyor of sharp political commentary, he’s also an advocate for the humane treatment of animals — two things we love. Check out his podcast for hot takes on both the political stories of the day, and those from years past that have shaped American discourse. Crybabies: Is there anything more cleansing than a good old-fashioned cry? Writer Susan Orlean and actor Sarah Thyre invite interesting people onto the stage with them for candid conversations about things in art and culture that bring on the waterworks for them. Hilarity and awkwardness often ensue — don’t be surprised if you shed a few tears yourself.